Try something completely different – a game viewing boat cruise on the Olifants River! The raised pool deck is the perfect place to chill on those hot summer afternoons! The rooms here are simple but comfortable – and the air-con is a welcome bonus when the heat is on! No frills style will make Sausage Tree just too simple for some – if you’re looking for cutting edge safari style then look elsewhere! We love the warm and personal service of family-owned and run lodges, and Sausage Tree Safari Camp in the Balule Reserve is a perfect example – guests consistently rave about Sonja and James as being wonderful hosts! This is the type of old-school camp where you can get to know your fellow guests (with 5 tents there’s a maximum of just 10 guests in camp at any time) whilst listening to the rangers’ tall bush stories as you all gather around the welcoming heat of the evening fire! Sausage Tree is set in one of South Africa’s lesser known reserves – Balule. The reserve was established by a group of private landowners in the early 1990s with the objective of creating a larger open system with no fences to hinder animal movement - thus creating a much healthier habitat for fauna and flora.The vision has paid off handsomely and the reserve has since grown from the initial 11 000 hectares to 40 000 hectares and in fact approximately 150 km of fences have been removed – Balule has thus in recent years been incorporated into the Greater Kruger National Park and there is a free flow of animals between them. Remember the old-style safari and sleeping under canvas? Well there truly is nothing like it and this is what a stay at Sausage Tree is all about! The sounds of the night are closer, the smells are stronger, and the feeling of actually being in the bush is so much more intense. 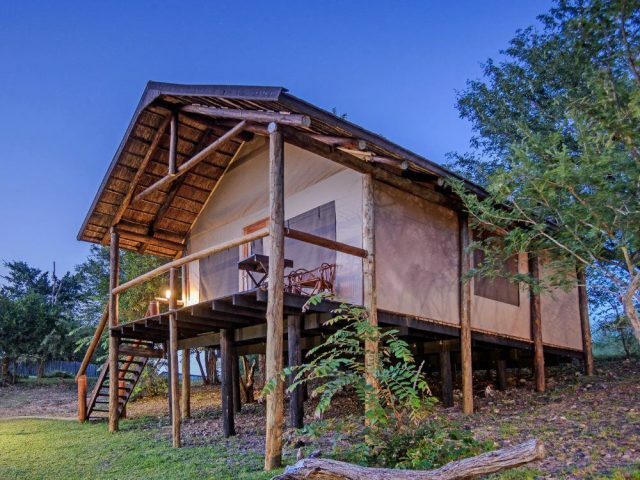 The camp’s four African safari-styled tents are nestled in between Marula, Knobthorn Acacia and Sausage Trees (of course!) and overlook a dry river bed, the bush and the spectacular Drakensberg Mountains in the background. 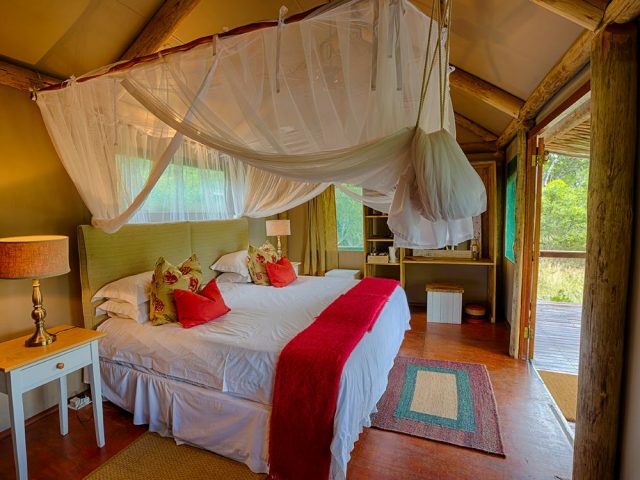 Each tent is spacious and set up under thatched roofs on elevated platforms so you can enjoy views of the surrounding bush - the tents are fully furnished and have their own private deck and en-suite bathroom with a bath and outdoor shower. You’ll probably be happy to note that the tents also feature air-conditioners which ensure that you will stay cool during those hot summer nights... and in fact they also act as heaters during those colder nights in winter too! Gauze on the windows and door of the tents ensure that insects are kept outside where they belong! At the end of a busy day you can fall asleep in your simple but comfortable tented suite, while listening to the sounds of the African night. Obviously given that it is open to the free flow of animals from the Kruger, Balule provides access to the full range of wildlife including the Big 5 – and with almost 3000 hectares of traversing you can certainly look forward to a true safari experience in the African wilderness! 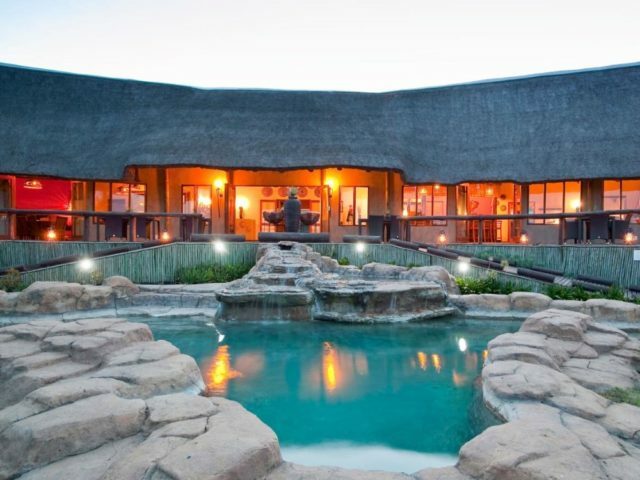 A highlight of Balule is the chance to go on game drives to the mighty Olifants River – the largest river flowing through this section of the greater Kruger and a perennial source of water to the area’s resident game. 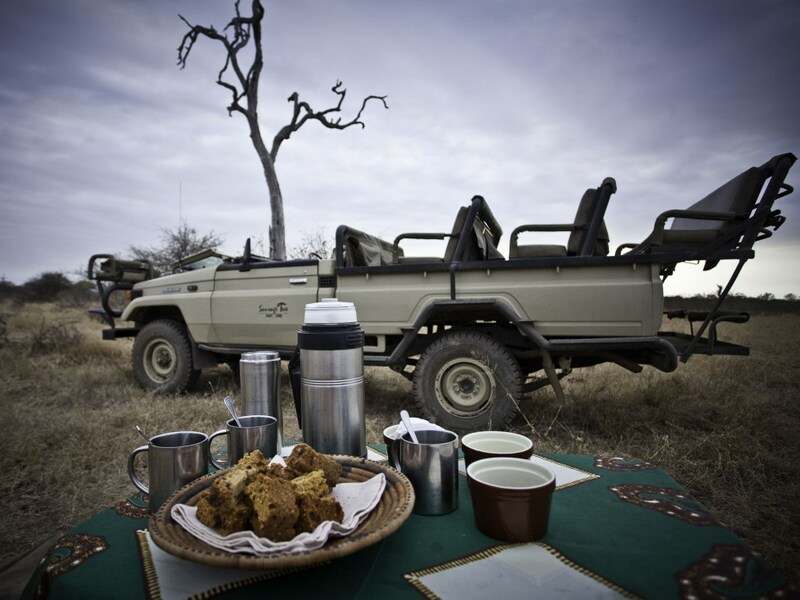 Each morning and late afternoon, an experienced and professional game ranger will take you on a game drive (bush walks are also available) in an open 4x4 vehicle through thick bush and along open plains in search of the Big Five, as well as other general game species such as giraffe, zebra, warthog, kudu and impala – the game drives are definitely the highlights of the day! Whether your interest is birding, insects, plants or trees - your ranger will happily share his knowledge with you! In fact the rangers can even focus on some of the less noticeable aspects of the bush (if these are what interest you) such as the Rhinoceros Beetle, how to make rope from a Raisin Bush or you could spend a while becoming acquainted with termites and their mounds! And for something completely different why not take a game viewing boat trip along the Olifants River! But after an enjoyable game drive and a few sundowners you are sure to come home ready for dinner – at this tented camp you can enjoy lantern lit dinners in the boma or on the open deck under the star studded African sky. When dinner is eaten on the deck on those calm, bright evenings, the fire place is lit adding more romance to those magical African nights! Lunches served on the open deck offer great views of the bush and waterhole which is frequently visited by a variety of resident animals (and the delicious food is also consistently raved about by guests!) The camp also has a simple lounge for those lazy siesta’s, and a cosy bar complete with a variety of first class South African wines. But it’s the refreshing deck pool that becomes the centre of attraction on those hot summer afternoons when floating in the pool represents about all the energy you can possibly muster! So whilst Sausage Tree is not going to satisfy guests looking for a designer bush experience, its unpretentious and authentic back-to-bush-basics (with the addition of air-con of course!) approach is one that results in many happy guests. 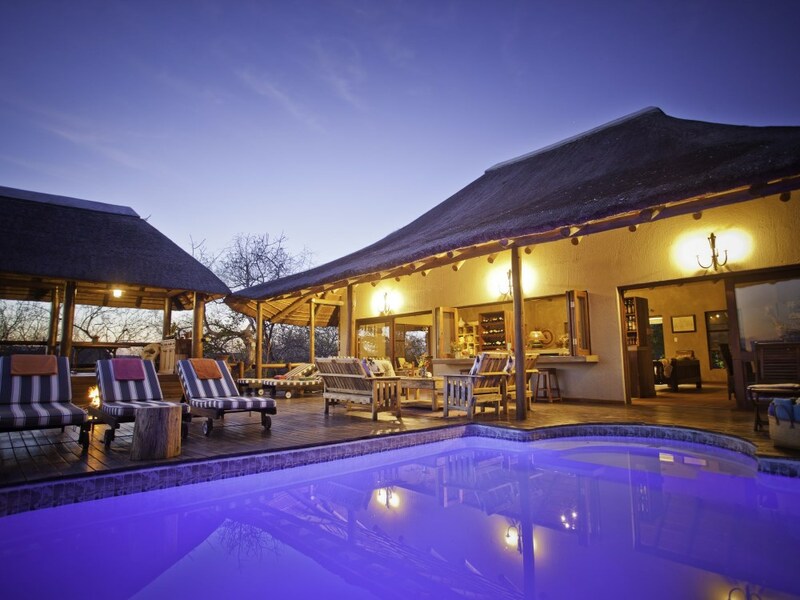 This family-owned and operated Safari Camp prides itself on the warm atmosphere and delicious food it offers not to mention the beautiful views – it’s an intimate bush experience in a relaxing environment where you can unwind, kick your shoes off and discover yourself all over again!